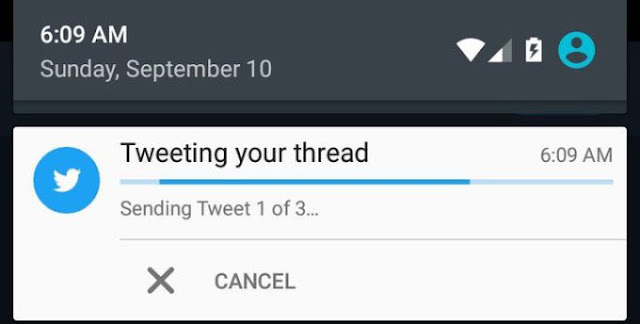 Twitter may be tweaking a new enhancement for its shirking 140-character feature, tweetstorm; which spotted in its latest Android app allows user to write out a tweetstorm broken into separate tweets, and tweeted at a go. Tweetstorm is a cheeky name for when someone spams your Twitter timeline with dozens of tweets, shirking the normal 140-character limit. Twitter could be on its way to making expanded tweets more accessible to all users, which the tweetstorm impassioned and poorly edited rants couldn't possibly achieve. The hidden feature was first spotted by Devesh Logendran, a Twitter user who broke the news of the feature to Matt Navarra, TNW’s Director of social media. While tweetstorming is not just to tweet separately or reply the first tweet, but you must need to reply the previous tweet one at a time to build a tweetstorm. Now, whether the making of tweetstorm is good for the bulk of information and its consumption on Twitter remains to be seen. Tweetstorms can actually contain a lot of useful information, as it serves an immediate means of communication.